Technology is so intrinsic to our lives that it is becoming a part of our bodies too. While it may be overkill to turn into Iron Man and take it upon yourself to save the world, many gadgets are now meant to be strapped, belted and buckled to your body. On-your-eye LCD Google Glass may be the most talked-about gadget owing to the sheer brilliance of its conceptualisation, but it's not alone in its ingenuity. Technology has pervaded every facet of our being, with smart watches and shoes fitted with mini-computers mapping data directly from our bodies. Nandagopal Rajan looks at how constant quantification and updation can be simplified through wearable gadgets. If Google Glass pretty much kills the smartphone with its call, surf, record and share features, we are yet to see the transition on a mass scale, an unlikely possibility in the near future. Giving competition to Google Glass are Epson Moverio BT, a personal video viewer that lets you access and browse the web while being aware of your surroundings, and the Sony HMZ-T2, an on-eye viewer that gives the best 3D video experience without actually sitting in a theatre. The glasses have two individual OLED panels that adjust pixel light emissions to zero for deep black and stunningly beautiful high-contrast images. Also on the way is the Oculus Rift, a 3D virtual gaming user-friendly headset, pre-orders for which are piling up. Activity trackers are one of the most common examples of wearable technology. They store data about you and analyse it using smartphone apps. 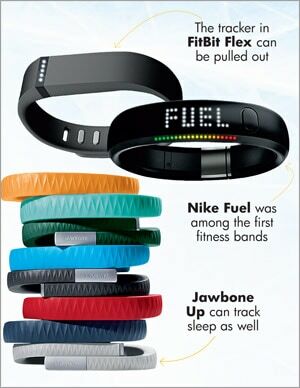 The Nike Fuel Band, Jawbone Up and Fitbit Flex - which are becoming popular in the US and other countries -- typically track your physical activity and tell you if you are reaching your fitness goals. The Up, for instance, lets users track food-and-drink consumption, and has sensors to gauge how much sleep you have had. Smart shoes no longer mean dapper and spit-polished footwear. Now it means sneakers that track your every step, alter in accordance with your energy levels and pack in accelerometers, gyroscopes and pressure sensors. Yes, they can be used to walk or run as well. While Nike is an old player, Google is entering new territory in its tie-up with Adidas to create smart shoes that will include a speaker to broadcast messages. 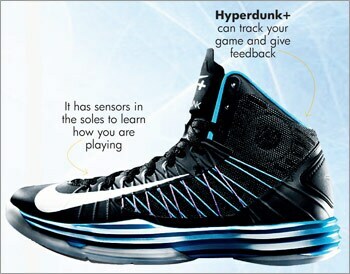 Nike's Hyperdunk+ uses the Nike+ tracking technology to provide real-time tracking and coaching to users through links to the Nike+ Basketball app. A wearable camera is nothing new. It is easy to get hold of spy cameras that snoop from the security of your pocket or a buttonhole. These new wearable cameras, however, are more about chronicling your life and less about spying. GoPro, the most popular chronicler of our times has gone places and seen wonders but it is still just too big. These brooch-like clip-ons from Memoto, for instance, capture a picture every 30 seconds so that you don't miss out a single moment in your life. Then there is the Autographer from UK-based OMG Life, which claims to be the first intelligent camera that can "enable spontaneous, hands-free image capture". This camera has a unique 136-degree eye view lens that clicks images that look like they have been shot using a fish-eye lens. 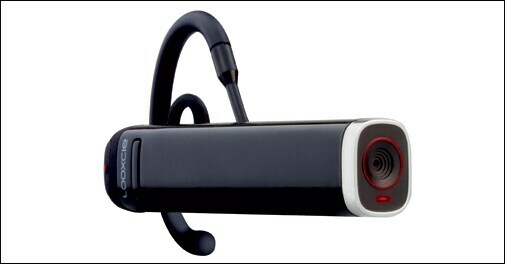 Another interesting device is the Looxcie HD, which livestreams 720p video from atop your ears - aided by Wi-Fi through an app on your phone.